Larry Knows How To Git-R-Done! Thought we would try something a little different for this Notes & Nerds Blog. 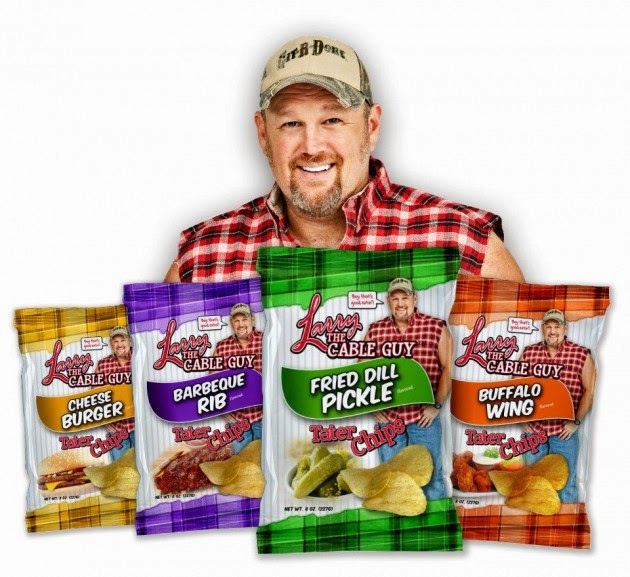 I will be doing a review on Larry The Cable Guy Tator Chips. I have tried some of thses chips in the past and really enjoy them, but I will sample all of them and give my honest opinion on each flavor. Taste: a nice tasting barbeque sauce flavoring with a smokey aftertaste. Taste: A heavey hot spicey flavoring with a mild wing sauce taste. Smell: A very pleasent dill smell. Taste: It taste just like a dill pickle, dead on! Taste: Taste just like Biscuits & Gravy, you get the taste of the gravy and sausage with the chip acting as the biscuit. Taste: A good ketchup and mustard flavoring with a light onion and chedder cheese taste. Taste: A nice ketchup flavoring with the tomatoes and a very light hink of vinegar. Smell: strong smell of onion, vinegar, and celery powder. Taste: strong flavor, not to salty. It definitely taste like mustard potatoe salad! Taste: a good flavoring of chili powder, salty and tangy, good chedder cheese flavoring, and a meaty aftertaste to it. I give a 4 1/2 outta 5 N&N symbols. Over all these tater chips are very tasty, great smell and a delious taste to them. if you would something dirrerent in a potatoe chip I recamend these! A porsche of the proceeds form his food products go to Larry The Cable Guy's Git-R-Done Foundation, a organization that donates to a number of causes like FFA, National Guard, and etc. The foundation has even donated more than $2 million to things like the Child Advocacy Center and to the Madonna Rehabilition Hospital. The Git-R-Done Foundation also helps troubled charitable organizations helping children and veterans.